How Can I Plan My First Trip to Italy? The crowds at the Vatican in Rome. Dear Fathom: I've been all over, but never to Italy. (Embarrassing, I know.) We have two weeks, and we want to see as much as possible — Rome, Venice, Tuscany, the Amalfi Coast — but we also want it to feel like a vacation and see what la dolce vita is all about. And of course we want to get far off the typical tourist route. For starters, no embarrassment. The important thing is that you're going. Italy is great for travelers. For seconders, those places you mentioned are pretty damn touristy. But for good reason: They're amazing. I've been going to Italy since before I could walk, and even the tourist-filled spots have their charms. Let's make this a top-down trip. Fly into Venice, work your way down to Florence and Tuscany, then to the Amalfi Coast, and leave from Rome. Or go from Tuscany to Rome and end your trip with a few days of total relaxation on the Amalfi Coast, with a flight home from Naples, the world's most incompetent airport. Learn the golden rule of Italy: Avoid August at all costs. August 15 is the national holiday Ferragosto. Everyone takes vacation in the surrounding weeks, prices at holiday resorts shoot up, and the cities become a wasteland of "closed" signs. Winter can get foggy and dark, which makes for moody fun, especially in Venice, but overall Italy is at its loveliest in May, June, September, and October. The trip will be an intensive crash course in Italy, with frenzied city visits mixed with mellow countryside days. I'll write less about the big cities and more about the less likely stops. Except in the dead of winter, Venice is a madhouse, a frustrating, tourist-clogged mess. But it's Venice, and it's breathtaking, even as you're cursing it under your breath. You'll see splendid St. Mark's, a glass-blowing demo in Murano (I did this last year at the Seguso factory and loved it; they were making glass fronds for a chandelier destined for the new Wynn casino in Vegas), get lost wandering the tiny warren of streets, and eat lots of seafood and cichetti (small plates). Stay at Il Palazzo (my favorite of the Bauers Hotels) for a splurge or at the charming Hotel Metropole. Both are centrally located just off San Marco yet are a necessary break from the crowds outside. Not usually hit on the whirlwind first tours of Italy, but Bologna is a great stop en route from Venice to Florence. Bologna is my favorite city in Italy, a microcosm of what makes Italian cities great: The food is incredible, the politics are a fantastic mixture of communist and haute bourgeoisie, the porticos are made for long passegiatas. The hotel I like best is Corona D'Oro. The other reason to come here is to see a big small city. Which is to say that the other cities you'll visit, Venice and Florence and Rome, are more touristy, and you'll get a different perspective in a city with fewer travelers but just as rich a cultural patrimony. 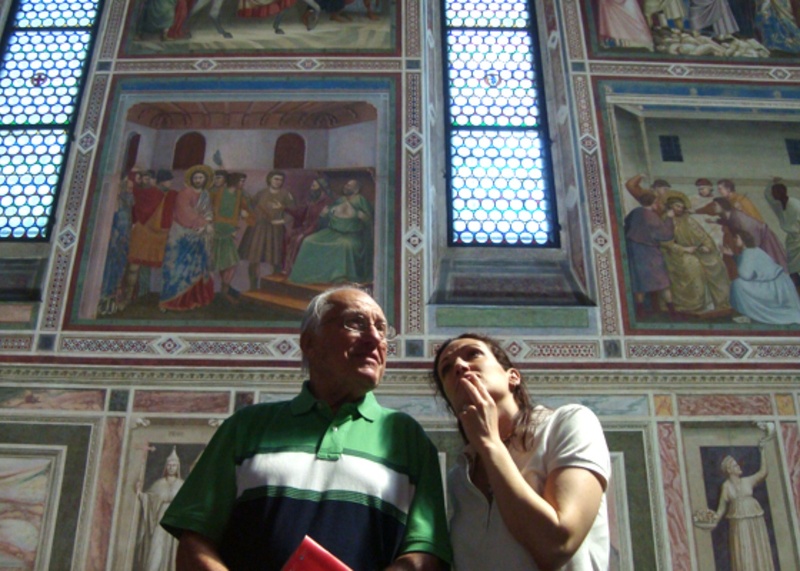 Pavia and her father pondering the frescoes at the Scrovegni Chapel in Padova. An option from Venice is a day trip to Padova, which is 40 minutes west by train and a must for art lovers. Giotto's Scrovegni Chapel is a mini Sistine Chapel, and it was restored to magnificent splendor a few years ago. The frescoes tell the life cycle of Jesus and Mary, and the damnation hell tableau would put Hieronymous Bosch to shame. This isn't a full day; it's an afternoon detour en route south, and be sure to make reservations before you go. But while you're in Padova, stroll Piazza della Frutta ("fruits") and Piazza delle Erbe ("herbs"), have a zabaglione at Caffè Pedrocchi (Stendhal considered it Europe's best cafe) and the incredible food stalls under il Salone, the massive Palazzo della Ragione ("justice"). Padova is a full day if you want to make a foodie side trip to Le Calandre, the three-Michelin star restaurant in Rubano outside Padova. Chef Massimiliano Alajmo is known for his avant-garde tweaks on traditional Italian cuisine. Don't come for the traditional fare; come for the art. Florence is a small jewel box: totally walkable, charming, compact. Amazing art, architecture, churches. Your first reaction will be, of COURSE the Renaissance was born here. 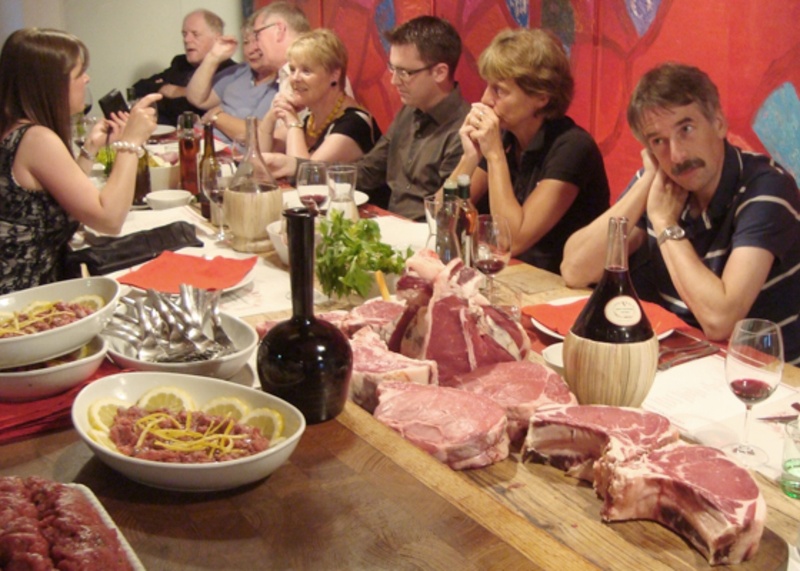 Dinner at Officina della Bistecca. Come hungry. You can do most of this trip so far by train. Trains in Italy are easy and convenient and not too pricey. There are high-speed and local options between big cities, and stations are usually in the center of town. Don't worry if you hear talk of a sciopero — "strikes" may happen frequently but are usually resolved within a day. (It's Italy; the chaos will make for charming stories when you're back home.) By the way, in decades of annual trips to Italy, I have never had a trip impacted by a strike. It will be easier to rent a car to potter around the Tuscan hillside, especially if you like driving. A meander from Florence to Panzano on route 222, then Panzano south on the 408, then farther south on the 326 and 146 is a beautiful way to spend a day or two. Further down in Tuscany, you'll find beautiful towns like Castelnuovo Bernardenga, Sinalunga, Pienza, Bagni Vanoni, and Montepulciano. Drive around, stop for lunch, potter some more. Lazy and easy is the agenda. Depending whether you want to end your trip in Rome or on the Amalfi Coast, you can drive down to the Amalfi Coast and keep the car to explore the area, or return it in Rome. For me, half the thrill of Italy is the driving, and why deny yourself the fun? 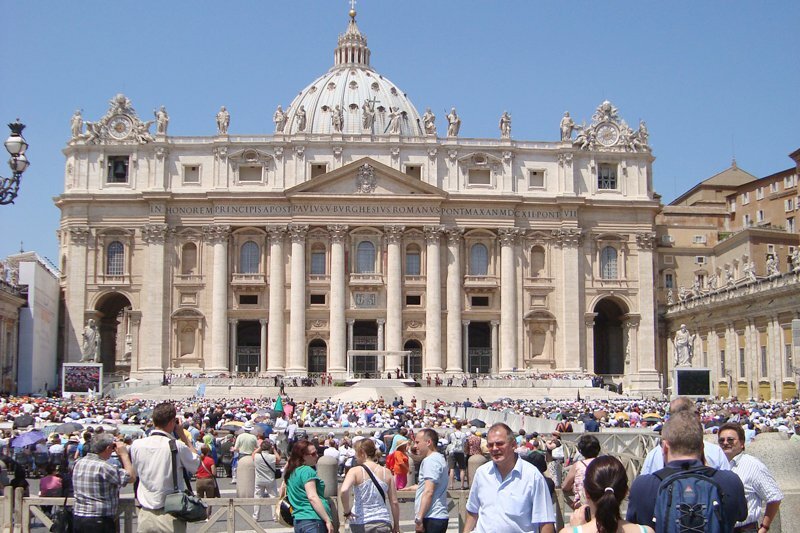 Rome will be a few intense days of museums and churches and sites. You don't have to go far to find them: Rome's ancient walls are on view at the Termini train station. The hotels to book are Casa Howard or Hotel Locarno. Wake up early to see the Vatican before crowds hit, go to the Forum and use an audio guide because it's engaging and you need help making sense of the crumbling columns, go to the Coliseum. I never come to Rome without eating gnocchi alla gorgonzola at Fortunato al Pantheon (a politico hangout owned by Fortunato, whom my father got to know when they palled around Rome in the '60s), snacking at 'Gusto, and eating as many meals as possible at Roscioli. The view of the coastline at Lo Scoglio in Nerano. Lo Scoglio in Nerano is my slice of heaven on the Sorrentine Peninsula. I come at least once a year. It's a family-run restaurant and hotel perched on the water two coves over from where the Bay of Naples meets the Bay of Salerno. This is the Amalfi Coast that no one comes to except Italians. Why? Because the main road goes from Sorrento to Positano, bypassing the peninsula entirely. Yes, really. The occasional movie star or fashion designer who is cruising on a fancy yacht might be at the next table, but there's nothing ostentatious or showy about this place; the De Simone family keeps it very casual and homey. The rooms at Lo Scoglio are named for constellations and have balconies on the sea — for very reasonable prices. From here, you can go uphill to Don Alfonso for meals, an overnight stay, cooking classes in their beautiful tiled classroom, and to get a fancier version of the Amalfi living. Day trips are easy. Margherita or Antonia De Simone can arrange for the local Italian boat service, Nautica 'o Masticiello, to take you to or around Capri for an afternoon. You can — and should, before it's ruined beyond repair — go to Pompei from Lo Scoglio on the local Circumvesuviana train. 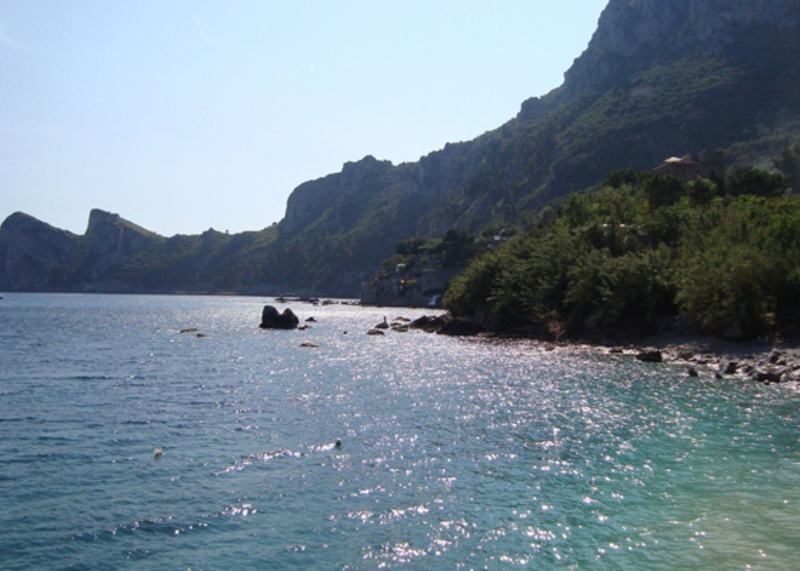 Other excursions include the coastal towns farther south: Amalfi (beautiful cathedral), Ravello (stunning hilltop views), and Positano (drinks at the legendary Le Sirenuse), but you should avoid Sorrento because there's nothing good there except the train station and the ferry to Naples. Actually, you skip Positano, too. It's overrated, overcrowded, and overpriced. But do stop into Le Sirenuse. Yes, it's a magnet for wealthy Americans, but it's gorgeous and it's epic. Of course, you could stay put and never leave the Lo Scoglio compound. Life gets easy when it turns into an endless procession of risotto alla pescatora or spaghetti with fresh clams and the freshest vegetables you've ever had. And then you go home. Depending how you do it, this is 10-12 days. It's Italy 101 to be sure, and I've left out Umbria, the Marche, Puglia. Stay tuned, because we'll be covering all these places soon. But don't expect to get enough: Italy will always leave you wanting to come back for more. Pavia is the founder of Fathom. She splits her time between New York City and London but is happiest on the Sorrentine Peninsula. You can follow her at @pavianyc on Twitter, Instagram, and Pinterest. She travels for the four-hour lunches.